"This simple but hearty meal is made with hamburger, potatoes, green beans, and diced tomatoes cooked in a delicious broth. Perfect for serving on those cold winter nights!" Brown the ground beef with the onion in a large skillet over medium heat; drain the excess fat from the pan. Stir the potatoes, beef bouillon, and water into the beef. Drain the liquid from the canned green beans into the beef mixture; set the green beans aside. Cook the mixture until the potatoes are soft. 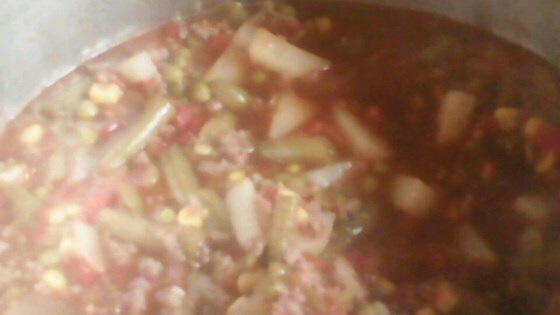 Add the green beans and diced tomatoes and cook until hot. Season with salt and pepper before serving. Add onion, garlic, oregano, a pinch of basil, seasoned salt, and a dollop of sour cream, and this is a real winner! It's ok. It does need spices. Makes a good side dish. This was excellent! We added a few ingredients...hominy, italian diced tomatoes instead of regular, and some more seasonings. Thanks for sharing this one! This was delicious, quick, and low calorie. We all loved it ~ I served it with homemade Bisquick biscuits. a keeper. i doubled the recipe, and the only thing i changed, is i used a can of corn in place of one of the cans of green beans. i loved it!